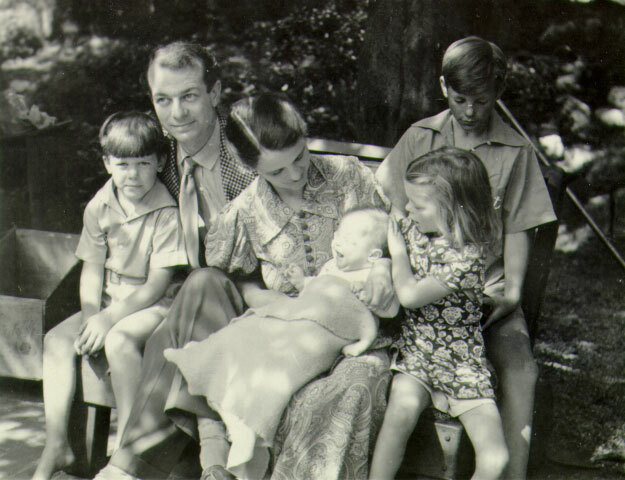 Linus and Ava Helen Pauling. 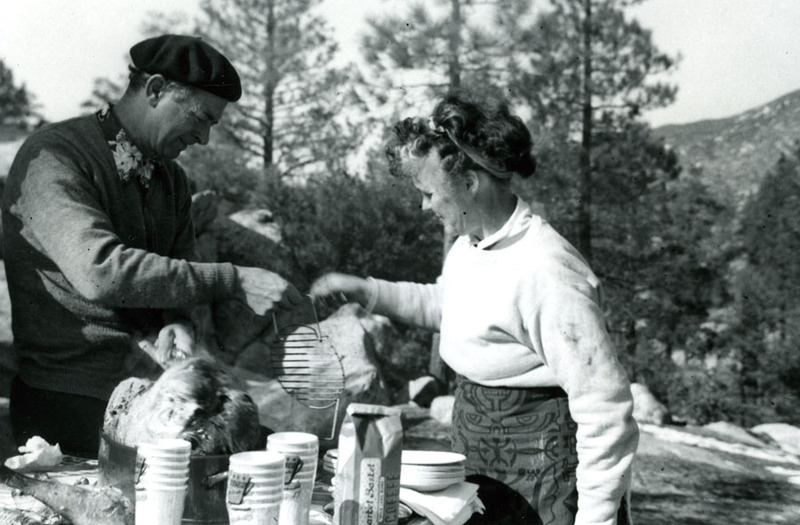 Angeles National Forest, Thanksgiving Day, 1952. This is the five-hundredth post that we’ve published on the Pauling Blog, and in this season of thanksgiving we find ourselves in a grateful mood. Five-hundred posts, surely at least a half-million words and, recently, our 500,000th view. Great thanks to you, our readers, who continue to seek out and use this resource in steadily increasing measure. 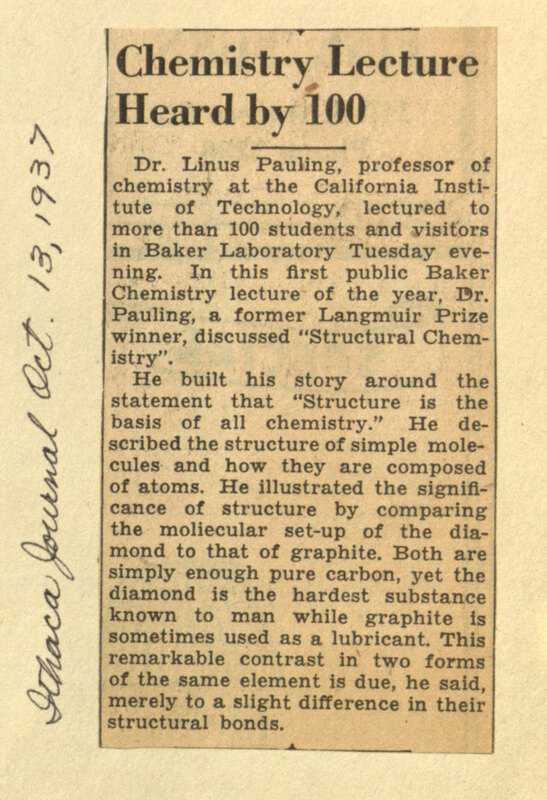 To celebrate this milestone, we are publishing a few excerpts from one of our favorite Pauling manuscripts. 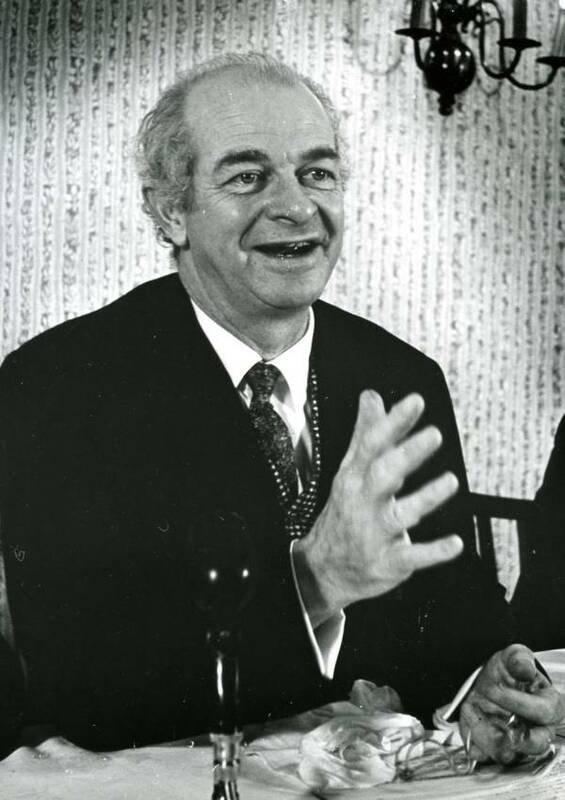 Titled “An Extraordinary Life: An Autobiographical Ramble,” the piece was written by Pauling for presentation to the Institute for the Humanities in Saledo, Texas, April 1989. 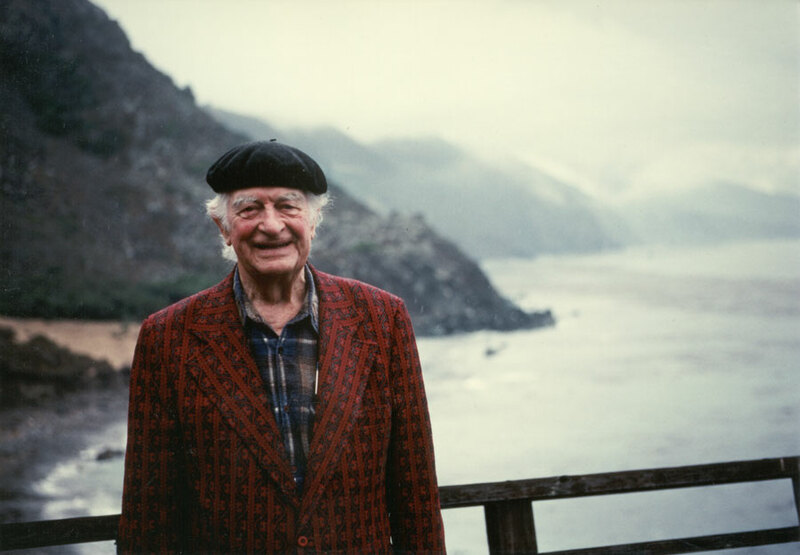 The text finds Pauling in an unusually reflective mood, speaking with serenity, at age 88, of a life spent dipping in and out of scientific disciplines in a most remarkable way. […] I am moderately smart. I estimate that there are 20,000 people in the United States who are smarter than I am, perhaps 15,000 women and 5,000 men. I reached this conclusion because a month after my wife and I got married, we had carried out some intelligence tests, and I discovered she was smarter than I, but we were already married. It was too late for me to do anything about it. Of course, I recognize that there are many physicists who are smarter than I am – theoretical physicists, most of them. There are a lot of smart people who have gone into theoretical physics, so there is a lot of competition there. I console myself with the thought that they may be smarter than I am and deeper thinkers than I am, but I have broader interests than they have. I don’t suppose that there is anybody else in the world who has a good background, knowledge of physics, mathematics, theoretical physics, and who knows a great deal about chemistry – the amount that I know. When I was eleven years old with no outside inspiration – just library books – I started collecting insects. Not only collecting insects but reading about insects. I was filling my mind with a lot of information about the lepidoptera and diptera and so on. 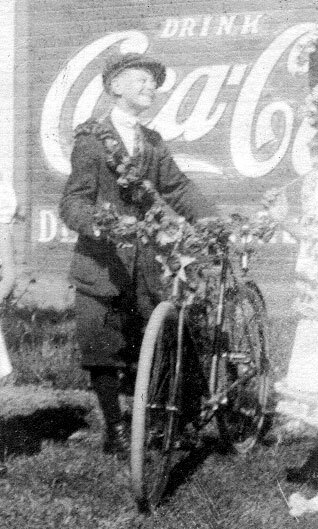 My father, a druggist, died when I was nine. There was another druggist who was a friend of the family to whom I went if I needed some chemicals when I got interested in chemistry, but I wasn’t interested in chemistry yet. I was just interested in insects when I was eleven. I said, “A person who collects insects needs to have a killing bottle.” And I got a Mason jar from my mother. So all I needed now was ten grams of potassium cyanide and perhaps fifty grams of plaster of paris. So Mr. Ziegler, the druggist, gave me ten grams of potassium cyanide and fifty grams of plaster of paris, and I took them home, went out on the back porch, because I knew that potassium cyanide was dangerous, and I dumped the potassium cyanide into the bottle. I mixed the plaster of paris with some water and put it in the bottle on top of it and let it harden. I had my killing bottle. I collected a lot of insects. Next year I got interested in minerals. I didn’t have very many minerals, at least that I could recognize, only agates. So about all I could do was go around Portland looking for piles of gravel where someone was putting in a house foundation or sidewalk. I’d go through the gravel looking for chunks of agate. 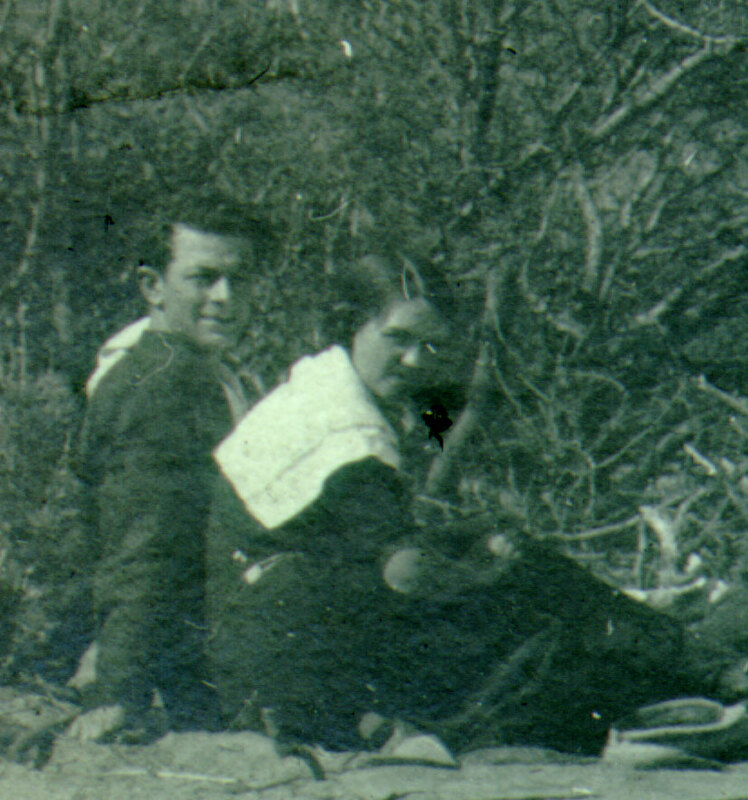 Linus and Ava Helen, camping near Palm Springs, 1924. “Have I made some assumption in reaching this conclusion? And what is the assumption? And what are the chances that this assumption is wrong? How reliable is the conclusion?” I have remembered this ever since and have continued to feel grateful to him ever since. It is possible to delude yourself if you have an original idea into thinking that there are observations that support this idea. Or it is possible when you think that you have developed some idea on the basis of a rational argument that you have made an assumption somewhere that isn’t justified. So this was very important in my development. Well, that was a really good incentive. I got busy and added ten pages perhaps and it came out as the second edition in 1940 and ever since then I have collected royalties. On thinking back on this man, editor of Cornell University Press, he is really a remarkable man in that he should think that it would be unjust to me not to get royalties on that book that had become a scientific bestseller. He was Amish from Pennsylvania and perhaps this may have something to do with his ethical standards. It is a good thing that people have ethical standards. People keep saying to me, “How does it come about that you shifted your field every five or ten years in a remarkable way?” In fact, all that I did was to expand my field of interest. I started out first determining the structure of minerals, and the second job I did was to determine the structure of an intermetallic compound — the first intermetallic compound to have its structure determined. For about ten years I worked on the structure of silicate minerals and of various other inorganic compounds. So that was one period, but then I got interested in the structure of organic molecules. And there was another technique. We built the first apparatus in the United States to determine the structure of gas molecules by electron diffraction. A friend of mine, Herman Mark in Germany, was the man who built the very first apparatus of this sort. So I began determining interatomic distances, and applying quantum mechanics which I had learned as one of the first people in the field in 1926 when I was in Germany on a Guggenheim Fellowship. All of this related to the question of the nature of the chemical bond. In the 1930s I formulated several new ideas about chemical bonds. In 1935 the Rockefeller Foundation had been supporting my work on the crystal structure of the sulphide minerals, and they said to me, “You know, we’re not really interested in the sulphide minerals. We’re interested in biological substances.” They had been giving me five thousand dollars a year. I thought, “What do I know about biological materials? Not very much. Hemoglobin, red cells in the blood, molecular weight about 68,000, that has four iron atoms in it. Iron compounds often are paramagnetic. So why don’t I apply to the Rockefeller Foundation and suggest that I measure the magnetic susceptibility of hemoglobin and hemoglobin derivatives?” So I did. And they gave me fifty thousand dollars. This shows that these fellows in the big foundations can influence activities of scientists. So we measured the magnetic susceptibility of blood. Venus blood turned out to be paramagnetic, and arterial blood was diamagnetic, meaning repelled by a magnet. Careful measurements of this sort gave astonishing information about the structure of the hemoglobin molecule. So then I thought, “Well, what about the rest of the hemoglobin molecule? There are four iron atoms and 9,996 other atoms. What are they doing? So I had better work on the structure of proteins.” I was giving a talk in 1936 at the Rockefeller Institute for Medical Research about the magnetic properties of hemoglobin. A man named Karl Landsteiner sent word to me, asking me to come to his laboratory to talk to him. I did. He said he was making immunological studies — antibodies, antitoxins. He wanted to know if I could explain some of his observations. So I thought about them for four years and finally wrote a paper, and when the second edition of his book came out there was a chapter by me on the molecular structure of antibodies. I hadn’t changed my course. I’d just gone on roads that have diverged a little from the ones I’d been going on. 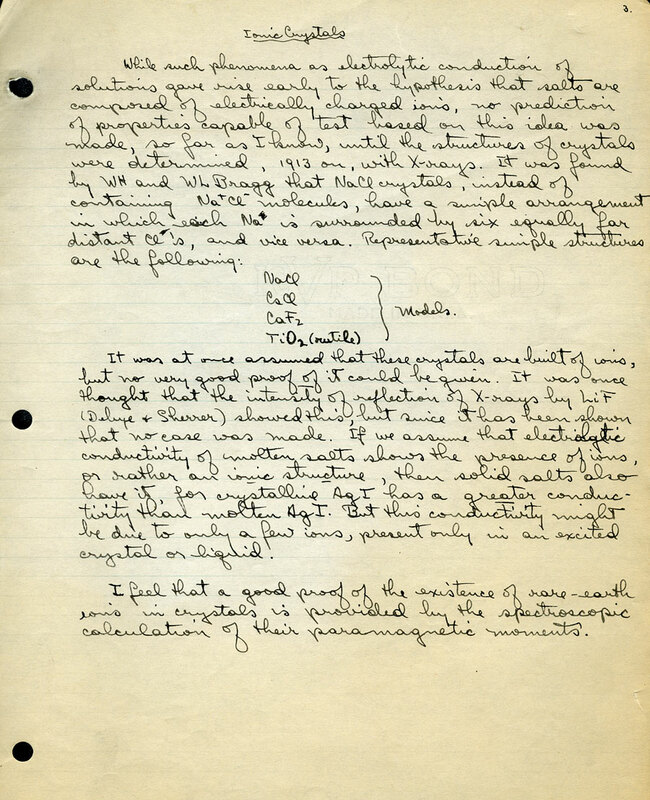 Segment of Pauling’s draft manuscript for The Nature of the Chemical Bond, ca. 1937. Pauling also found a few diversions to break up his otherwise relentless pace of writing and lecturing while at Cornell. For one, he took advantage of the opportunity to sit in on various campus lectures. On November 11, for example, Pauling “listened to a long talk” that was “rather boring” but still boasting an interesting point or two – on the sweet-potato starch industry.” Pauling also engaged in some reading, including Edwin C. Kemble’s The Fundamental Principles of Quantum Mechanics with Elementary Applications. He likewise found time to read for pleasure, most commonly the Sunday paper and Time magazine. He included a bit of space for fiction, including two short stories by Thomas Mann and Christopher Morley’s The Trojan Horse, which he found “very amusing” and useful for “put[ting] me in the mood (Liny’s word) for sleep.” Alas, the technique didn’t work too well, because the next day a weary Pauling wrote to Ava Helen that he was going home early to finish the book and go straight to bed. I am working hard now so that if you do come back with me in January I’ll have more time to play with you. We would have fun going to Princeton and Yale (also Buffalo – we would go to Niagara Falls again). I liked having you in the Lab. with me, but I did get worried about you, thinking that you were bored while I was trying to work. If you come back with me I’ll work in my/our room and you can read or go to bed. We used to do that in Munich. You have forgotten what it is like to have Paddy with you working. Though Ava Helen initially protested the idea of going back to Ithaca, she gradually warmed to the suggestion. For it to happen, they needed their helper Lola Cook to take care of the four Pauling children, including Crellin, still an infant. This may not have been too difficult to arrange since Ava Helen had told Linus earlier, on November 11th, that Lola “said she wants to take care of the baby!” On December 2, Ava Helen wrote, “I’d leave Lola with the baby I think and get someone to do the work. I’m hoping that after three weeks at home you will want to return to Ithaca alone. That would be simpler and less expensive.” Those three weeks, as it turned out, were not enough, and Ava Helen returned to upstate New York with her husband in January. 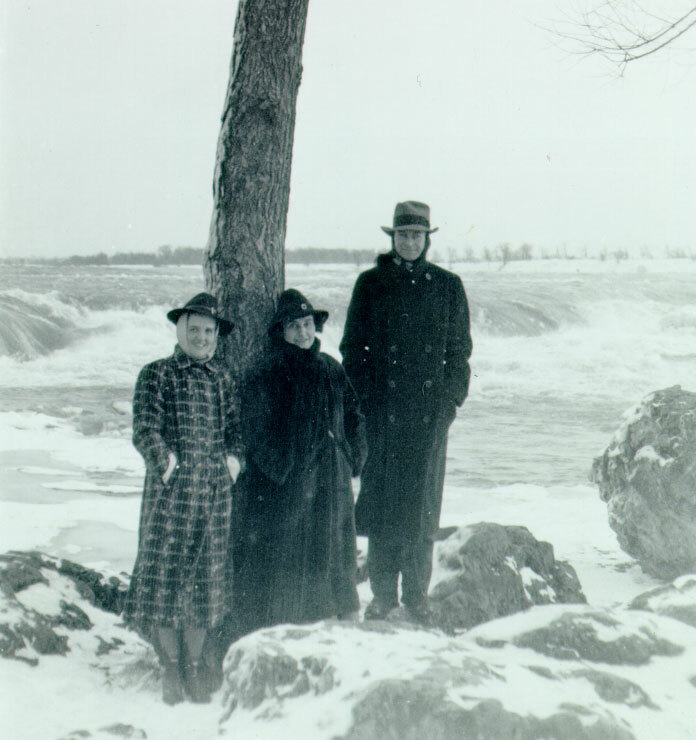 The Paulings and Yvonne Handy at Niagara Falls, January 1938. 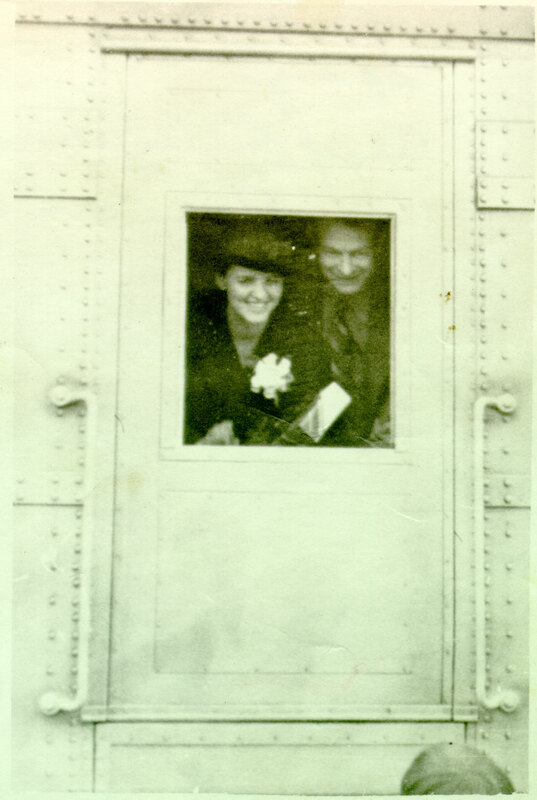 Ava Helen and Linus peeking through a train window, Spring 1938. 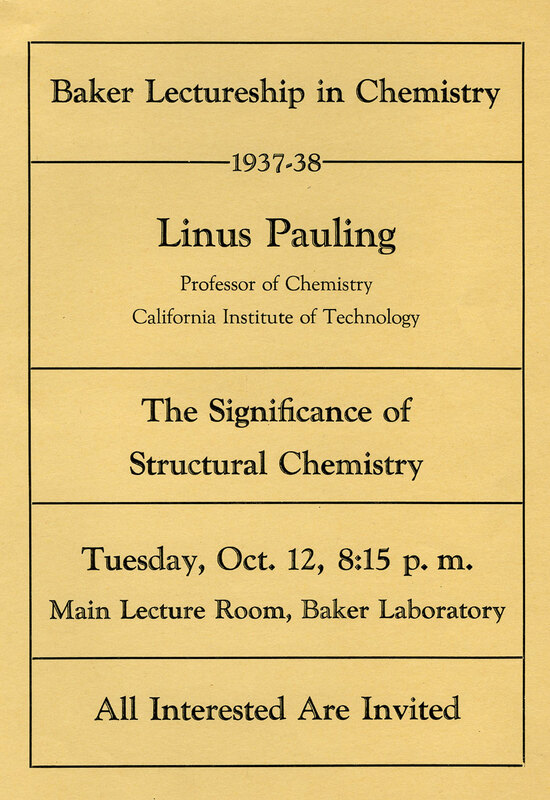 By May contacts at Cornell were inquiring into the whereabouts of Pauling’s book, but the author still had one chapter left to write. On May 10 he told Hughes, “I am indeed anxious to get my book finished, but I am having trouble in finding time to work on it.” Pauling decided to begin sending it in sections and told Hughes that he would finish it by the end of June, at which point Hughes could make his way back to Pasadena. While he had not yet begun sending the manuscript to Cornell, Pauling resumed his correspondence with Papish to discuss a second edition; according to Pauling, “the field is progressing so rapidly…[a second edition] probably should be prepared in about two years.” A month later Pauling began sending chapters one-by-one, telling Hughes that he was mostly finished “except for two or three odd sections” and “some of the figures.” Pauling would find that his delay in getting a final manuscript to Cornell would only cause trouble and interfere with his plans to use the book in his classroom the following year.